The soft colors used in this home inspire rest and relaxation! 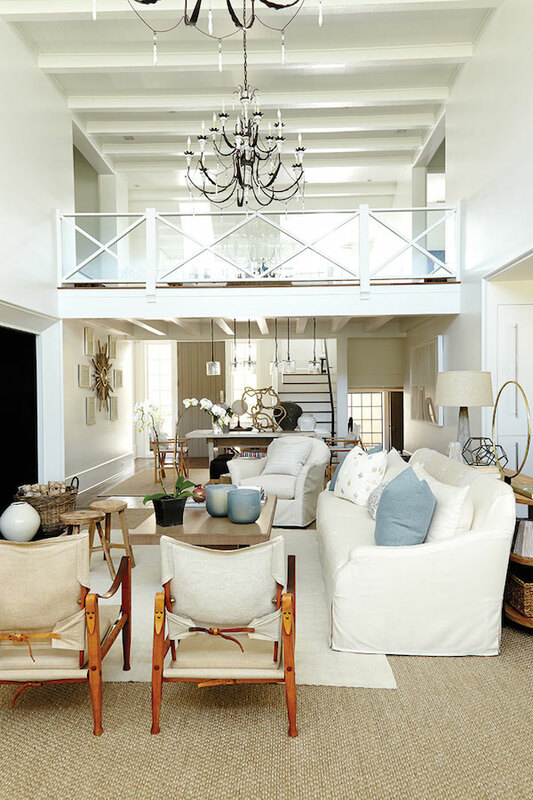 Layers of texture and pattern bring a charming coastal charm to this loft. I think this would be a perfect spot for a cup of coffee in the morning! I love a lamp on a kitchen counter. It adds such a nice homey ambience, don’t you think? 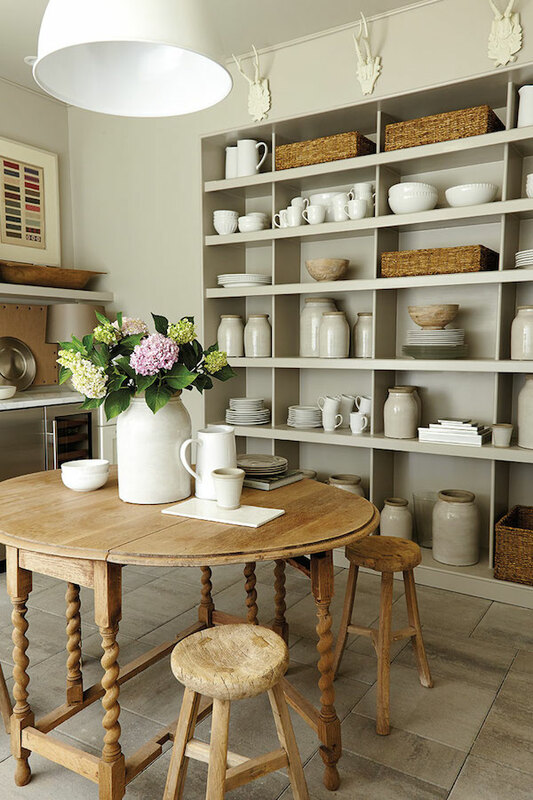 Pretty white dishes and wicker baskets are displayed so beautifully on the open shelves in this casual dining room. It’s all too pretty to be behind closed doors! Nothing beats the look of new and old pieces mixed together in a home. It creates that perfect and comfortable lived-in look I love so much! 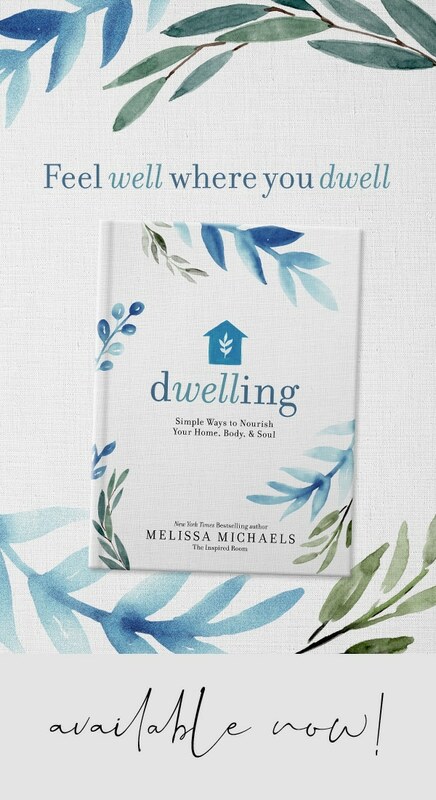 Melissa, I am with you on this one, could move right in! Love it. Absolutely beautiful! I love it!! I feel like I would breathe deeper in this house. So calming and beautiful. You wouldn’t happen to know the paint colors used, would you? I don’t usually comment on blogs, but I just toured this home yesterday (it’s in my town) and had to chime in! The house was gorgeous, and the decorating was sublime. 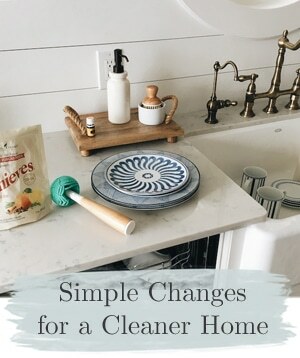 And so livable – I toured it with my husband and our two-year-old son, and was pleasantly surprised at how comfortable the house seemed, even for a toddler. The only problem is that I am now obsessed with the Ballard Designs white chairs from the loft area (they’re actually swivel gliders, believe it or not). They’re 10 times more beautiful in person and are seriously the most comfortable chairs ever. But at $800 a pop, they are sadly not in my future! Courtney, by some miracle – since you visited the house, do you happen to know or recollect the color of the kitchen base cabinets? I love the shelves hanging from the ceiling. You could even put them in front of windows. The colors are beautiful I can feel the serenity. I love everything about this home…especially the mix of old and new. Thanks for sharing. Planning to pin this ideas. 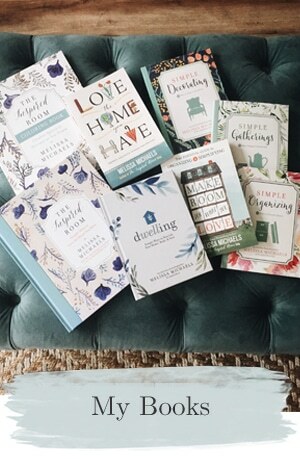 Beautiful, beautiful home – thanks for sharing – think that loft’s going to get pretty crowded. Love the lamp in the kitchen. 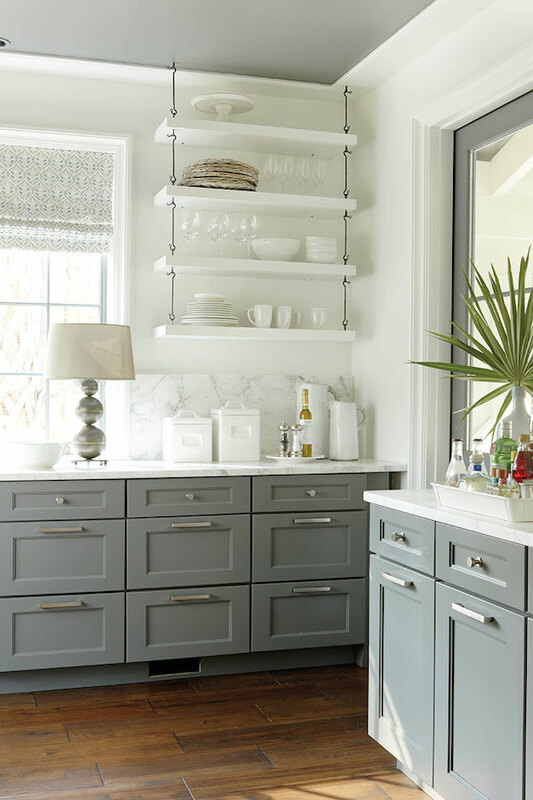 I have two with matching decorative shades with the green and creamy white that my kitchen will ultimately show off when I get the cabinets and walls painted. Early morning sun doesn’t come in through the solar tube or the south and west-facing corner windows and I detest turning on the two Texas- sized fluorescents, so the lamps are perfect for pouring coffee and serving kitty breakfast. And here you go again with inspiration! The Mix of Old & New photo shows a long table so interestingly styled on tile floors yet. I’m planning on rehousing the huge queen sleeper sofa when I redo my floors with tile in a similar pattern. Seriously thinking of not replacing the sofa since I don’t really need it and placing an antique 6′ dropleaf oak table against the vaulted wall under my beloved aspen artwork and working up from there. 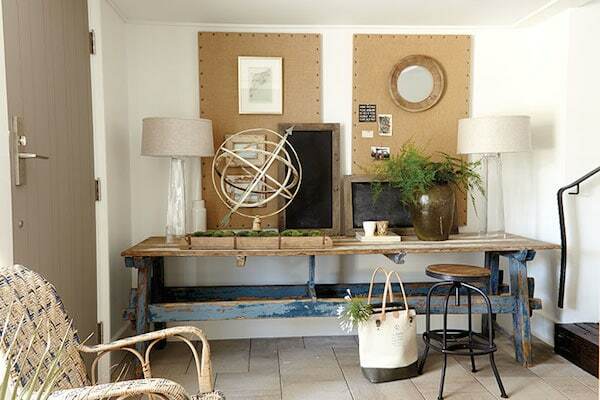 Although I’ve seen a lot of very formal foyer table vignettes and this looks like a sort of foyer as well, I love the informality and the sunroom feel with the wicker chair, etc. My living room is all about the dark-framed 8′ picture/sliders combo window and the adjacent 6′ patio door looking out onto a gorgeous greenbelt. Who needs a couch on the only wall that will accommodate one, forcing one or two visitors to look across to the other solid wall and miss out on that gorgeous view. I think I’m no longer seriously thinking but now convinced of my direction. Thanks again for doing your thing, Melissa! LOVE the darker cabinet option. I love the mixture of the old and the new! Just beautiful. 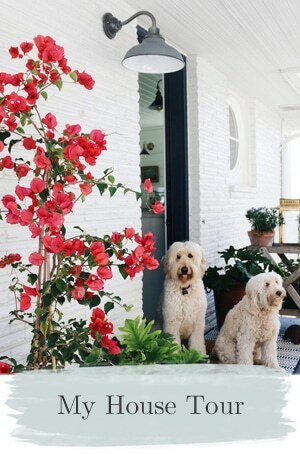 Just the photos of this home send calming vibes. Design Inspiration indeed! I especially like the lamp in the kitchen, we never think of that but why not?! Hi, just would like to say that the house is beautiful! 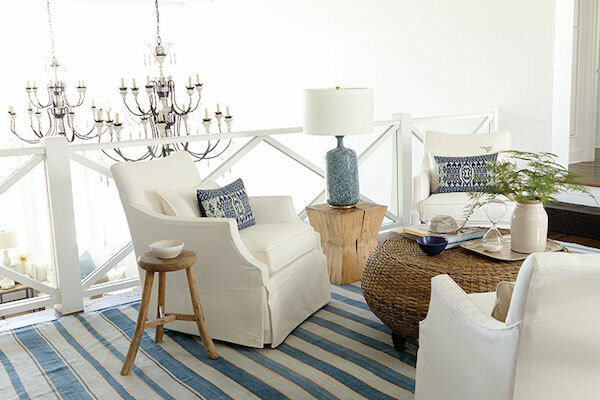 Like everything and felt in love with the striped blue and white rug. Could you please tell me where I can find one like that? Thank you. Hi Lara! It isn’t my house so I’m not sure, but I would guess maybe Dash and Albert? They have great striped rugs! 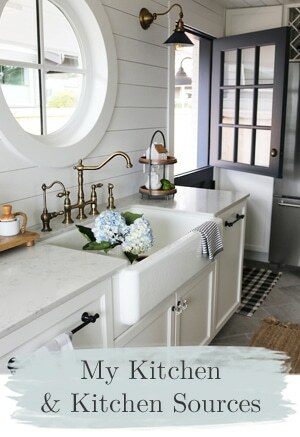 Does anyone know the paint color on the kitchen cabinets? Do you know the color used on the cabinets? Would a color expert or a decorator please help us out by taking their best guess as to what they think is the color of the lower cabinet. Thanks for helping. Does anyone know who we can call to get the info? Emilia, I’m afraid I don’t know the details on the paint colors. When I toured the house, they gave me a handout with all the sources used in the home, including paint colors, but I recycled mine long ago. 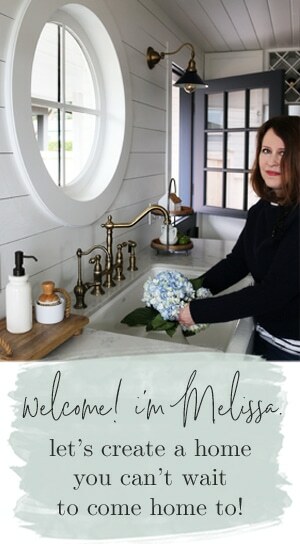 The interior design for the home was done by http://www.suzannekasler.com/ – you might try contacting them! Does anyone know details on the catwalk? Is this custom made I assume? Tempered glass? Plexiglass? Would love more details as I’m trying to recreate a similar one!